How will this double convection oven arrive? Is there anything special I need to know about setting it up? 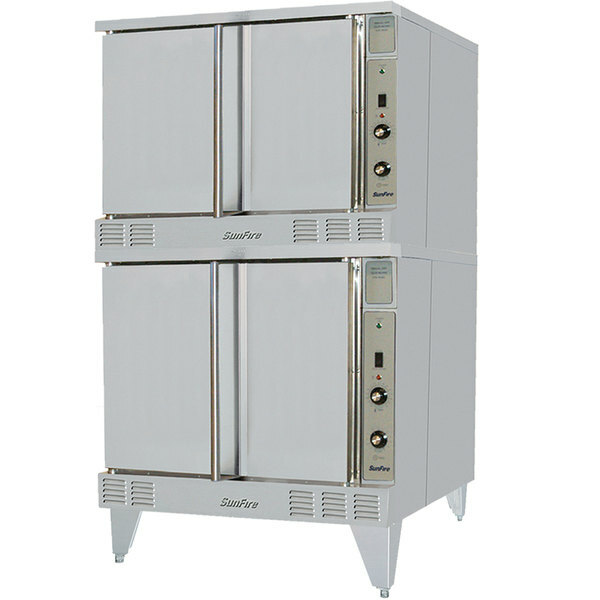 Double deck convection ovens like this one will ship separately. You will need to un-crate each oven and then stack one on top of the other as part of the installation process. Consult your installation manual for details specific to the oven you ordered. How do I know if the listed amperage is in reference to a single oven, or the combined total for each individual oven? If you're ever unsure of an electrical specification and how it relates to your operation, be sure to check out the Specification Sheet or consult a qualified technician for additional information. Bake delicious bread, cook casseroles, and create other tasty dishes with the Garland SunFire series SCO-ES-20S double deck electric convection oven! This convection oven features two spacious oven chambers, each with a porcelainized interior and coved corners for easy cleaning. Interior oven lighting provides great visibility, and it comes with 5 adjustable, chrome-plated racks per oven. A 2-speed fan with windows is mounted in the left door, and solid state analog controls with a 60-minute timer help even the busiest kitchens and bakeries keep track of their culinary creations. This is a beautiful double deck convection oven by SunFire! It has 2 speeds for fast or slow baking! Great oven for a bakeshop or banquet kitchen! !